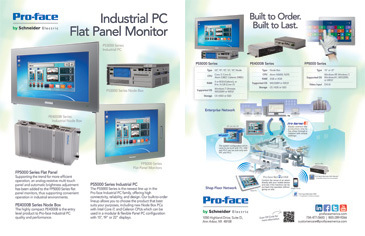 The PS5000 Series is the newest line up in the Pro-face Industrial PC family. The two display sizes, 15.6" and 18.4" offer a slim design, and low reactivity glass that creates less glare and higher contrast. This powerful IPC has a Core i3 processor, fanless design, and extensive connectivity options. In addition to cutting-edge functions such as gesture operation and a brightness sensor, the FP5000 Series provides a high level of environmental resistance with features like a maximum ambient operating temperature rating of 60°C and an IP67F protection rating.